In March I visited Chicago for the fifth time to attend the International Home and Housewares Show – continuing work on bringing Pliio to more retailers, but also scouting to share the latest inventions with you. It was wonderful to see many new items and also the growth of products I spotted last year, like Gleener, Fresh Tape and Holster Brands and (re)zip from Blue Avocado. Boot Butler is available at Bed, Bath and Beyond. Congrats to inventor, Andy Elstein. Meet Patrick Triato from The Goodwell Company and his new take on the toothbrush. This eco-friendly toothbrush addresses the goal of reducing waste with a base you keep forever, offers a subscription-based service for biodegradable oral hygiene components, a storage compartment in the base, and a string on the bottom which would allow you to hang it from a hook – perfect for those who like to brush in the shower. The picture above does not do it justice. Check out their website for a close up. The toothbrush really looked like it belonged in the MOMA store, and it felt fantastic in your hand, too. Congratulations on being a finalist for the Innovation Award. The holidays are a beautiful time, but if you’re like me, and sensitive to ‘visually noisy’ environments, all of a sudden they can feel too much. I recommend a major edit during or right after the holidays. Sort out the things that no longer inspire or fit you, or are too worn or damaged to be repaired. The picture below shows what we were able to cull just from my kids’ closets. They’ve both been doing some major growing so it was a little easier than usual to identify clothes they would no longer wear. Find comfortable homes for the new items. This may take some problem solving along with organizing supplies. The goal is to make whatever you put away easy to find when you need it. We finally implemented Pliio® Clothing Filers™ in my daughter’s antique dresser. Her drawers are 5 1/2″ deep, so perfect for the new smaller size. The wardrobe edit coupled with the addition of Pliio means there is now plenty of space in the drawer so garments can be retrieved and put away with ease. No clothing wars! For more space saving ideas, check out the CTV Canada AM segment I shot with host Marci Ien on January 5th! Exciting New Organizing Products from the International Home and Housewares Show 2014 – Part 1 – Impressive inventions! The International Home and Housewares Show is a fantastic place for inventors to showcase their creations. Inventor’s Corner is packed full of mini-booths manned by the inventors themselves. There are opportunities to listen to informative presentations and pitch to panels of experts. Any inventor who wants to get a product for the home to market should consider this grand-daddy of shows. I spent almost all my time in Fresh Home Element’s booth sharing new additions to the Pliio® product line…coming to Bed, Bath and Beyond later this spring. I’ll share more on that in a later post. But I did make time to scour the show for nifty new ideas. On to the neat inventions I found! Want a safe space to stow a hot iron or place your glasses down beside your pedestal sink? Anyone with a lack of counter space knows that pain. Holster brings these cute and colourful silicon holders that stick over the edge of the sink and to flat wall surfaces. Think a school locker or a mirror, for example. Awesome, punchy branding and a great display. I’m looking forward to sharing more Blue Avocado products on The Shopping Channel this year. These reusable, resealable bags are amazing for food, toys, cosmetics and more. If you’re feeling sad about single use plastic, this product is definitely for you. Shipping in June, check out this innovation in boot storage from inventor Andy Elstein – The Boot Butler. Check out how it works in the 2-minute video. I love how it uses the depth of the closet rather than just the narrow vertical space boots normally take up. I’ll bet Professional Organizers out there will love this product. Meet Milton Wheeler who has solved this problem: ever need just the right length twist tie? Comes up every time I want a quick and affordable cable management solution. The Twist-tie Pod lets you roll out and cut the length you need. Going to get one for my kit bag. Comes in a few colours. Accepting pre-orders. …which comes in super fun designs like this one! Meet Chris Tassin from Cabidor. Over the door organizers often feel unstable (unless strapped down), can’t support that much weight, and get overloaded compromising the passageway. This ingenious design mounts the organizer to door hinges which take a considerable weight. With designs for jewellery, bathroom supplies, pantry items, and more. Extra points for your cool company name: Hingenuity, Inc. I found “What’s That Paint?” last year at the NAPO conference. Lovely to see additions to the line in smaller sizes, something I mentioned at the conference. Decanting paint into smaller containers reduces the amount of air inside and promotes longevity. Way to go Deanna! And here’s another favourite I’ve written about, from fellow Canadian inventor, Kim Cole. Wonderful to see Kim’s continued success with Gleener, the best tool I’ve found to de-pill sweaters. Some of you may know that in addition to providing organizing services I have been hard at work developing a product to make managing folded clothes a whole lot easier. I’m excited to share the launch of the Pliio TM clothing filer on HSN – the Home Shopping Network – on Thursday, March 22nd, 2012. The Pllio clothing filer is a tool that helps you fold, file and find your clothes. Here are four reasons why Pliio will put you back in control of your closet. I’ve long witnessed people struggle with tall stacks of clothes, or dig through unkempt drawers trying to find a certain item. Invariably, the bottom items in a pile rarely get used, and often become what I call “drawer filler”. This can be as much as 50% of the items in a drawer. Problem solved: Pliio clothing filers enable you to store items vertically, to file instead of pile (we organizers LOVE that), which means you can see every item you own. I am beginning to wonder if the ability to fold neatly is in our genes. Some of us have it, and some of us don’t. And to be honest, some of us care, and some of us wonder why we are even talking about this. In my practice so far though, the large majority of people covet a well-0rdered space. But not everyone can get there on their own. Problem solved: Pliio clothing filers act as folding tools ensuring a uniform finish. Even four year old kids can fold with Pliio. Moms – do you see the potential to offload here? It’s actually an empowering thing for kids to be able to fold by themselves and get it right. We want to see the efforts of our folding last, and the sad reality is that pulling an item out, especially when in a rush, causes pile pandemonium. 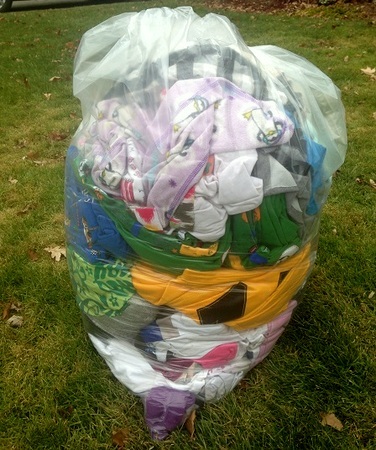 I worked with an otherwise loving couple and when we started talking about the closet the wife declared quite firmly that her husband could not use the shirt on the bottom of the pile…because she had just folded it, and it was not to be “messed up”. Problem solved: The beauty of using Pliio clothing filers is that when you pull an item out, nothing happens to the rest. I have seen jaws drop over this. Truly. I see many bulging drawers and crammed closets, largely due to a lack of consistent folding. Folding clothes in a haphazard fashion actually takes up more room. Problem solved: Pliio clothing filers fold garments to a uniform size often allowing more items to be stored in the same space. While not yet available in Canada (yet – I’m working on it!! ), I’m thrilled to say Pliio had it’s television debut on The Marilyn Denis Show. At Marilyn’s request, I demonstrated the product, showing how the Pliio clothing filer makes folding and storing scarves a breeze. If you’d like to keep up to date on Pliio news, just let me know and we’ll add you to the Pliio newsletter.